*Updated July 5th to include downloadable resources, linked below, and July 21 with YouTube resources. Take time this summer to read Screenwise (2016) and Dr. Devorah Heitner’s website Raising Digital Natives, Twitter, and TED. (or find the book on Amazon) Screenwise is essential reading for educators and parents alike - and now that summer break is coming, get reading! Although it could appear to be a book of strategies for parents to help children deal with the technology “bombardment” at home, as I read I found that I was taking copious notes on the suggested strategies so that I can help the parents of my students, as well as more deliberately guide students to better decision-making as they develop their digital identities. I took 30 pages of notes, but the following is just scratching the surface of those notes, let alone the book itself. I am also very impressed with how Dr. Heitner frequently makes reference to further reading and research, a very important part of the “sharing economy”. My contribution includes three handouts and a Drive document that can be shared with parents, or modified by educators. I would like to thank Dr. Devorah Heitner for granting permission to use widely from her body of research. Upon writing this post I’ve noticed that I have pulled from various parts of the book at random. This post is also meant to “tease” the reader - the strategies bulleted here are only samples from the book. 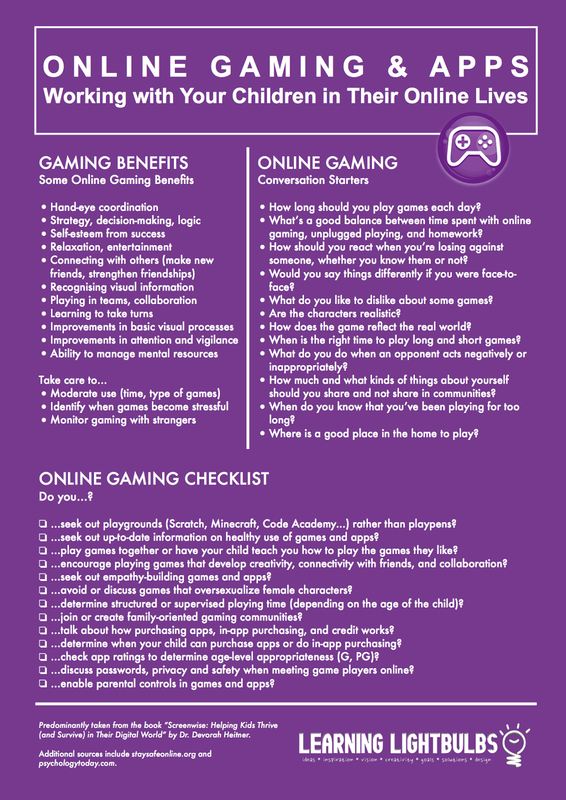 (I do intend to do further research and create my own parent-friendly resources, crediting the sources used) For now, if you like what you see in this post, pick up a copy of Screenwise and enjoy! From YouTube: Parent Resources, Teen Safety, Harassment and Cyberbullying, Suicide and Self-Injury (incl. US confidential help services), Privacy & Safety Settings, and Additional Resources. To support parents in becoming digital mentors to their children. Find balance in the digital world. Acknowledge the benefits of technology. With regard to mentoring, she recognizes that it’s about guiding kids through their mistakes and to empathize with their lives, pointing out that kids feel pressure to keep up with their peers or might feel left out. (FOMO - fear of missing out, making ‘likes’ and ‘follows’ important to their feeling of social standing) It’s also about modelling proper behaviour for children. I would suggest that this applies to educators' behaviour in schools as well. Her research points out that many kids feel there are rules for adults and rules for children. I think that this is probably okay, but adults do have to be careful about hypocritical behaviour. Kids are watching us. Heitner notes that devices don’t cause social-emotional turbulence, but can heighten it. As with any time in history, some personalities are “wired for drama”, thus we have to help kids identify when it’s time to plug into different online communities when there is negativity in one. More important than privacy is safety. Bullying has always existed, but these online communities now give bullies a new outlet. Kids need to learn guidelines for when they are bullied, blackmailed or see bullying happen. In addition to this is having a frank discussion with kids about what is online, and what content is made for adults, giving strategies to deal with adult content that kids may come across, as well as how to protect themselves from talking to online strangers. What areas a the biggest time wasters? How does texting (and posting) sometimes lead to conflict? 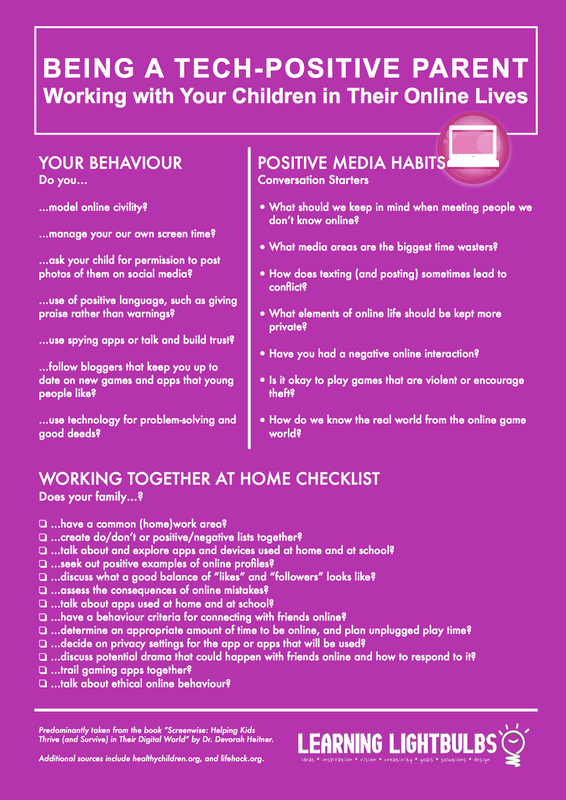 In what situations should a child tell their parents about a negative online interaction? *See a checklist on page 80 of Screenwise. Dr. Heitner suggests empathy being a critical approach to helping your children. Think about their weekly schedule. Do they have too much “going on” to even eat? (which leads to fatigue and poor decision-making) Find well-timed, authentic opportunities to model good behaviour, such as sharing your text messages, or asking if it’s okay to post their image (which indirectly says “this image belongs to you, not your parents” - they’re empowered). This modeling teaches self control. Mentor the proper use of phone conversations and emailing. Understand that children may not want to hang on to old photos - their last few months may have been socially a bit rough. As a parent, should you choose to monitor texts and posts be sure to have a response to negative content (such as gossip, foul language, negative talk about teachers and other adults). If you choose to monitor, have a plan to move towards the child’s independence. Have the child work with you to create the ‘rules of engagement’. 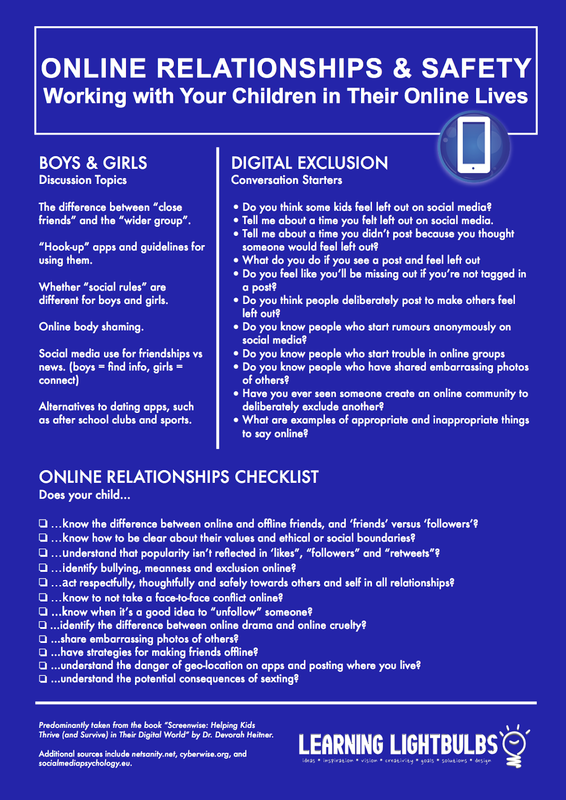 Know the difference between online and offline friends? Know how to be clear about their values and ethical or social boundaries? Understand that popularity isn’t reflected in ‘likes”, “followers” and “retweets”? Identify when a person is being excluded digitally? Identify bullying and meanness online? Act respectfully, thoughtfully and safely towards others and self in all relationships? Know to not take a face-to-face conflict online? Know when it’s a good idea to “unfollow” someone? Identify the difference between online drama and online cruelty? Are they “alpha good” or “alpha bad”? Do they try to please everyone? Do you think some kids feel left out on social media? Describe a time you felt left out on social media? Describe a time you didn’t post because you thought someone would feel left out? What do you do if you see a post and feel left out? Do you feel like you’ll be missing out if you’re not tagged in a post? Do you think people deliberately post to make others feel left out? Why would someone do that? Can your child articulate the difference between a friend and a follower? Does your child realize they don’t have to friend someone to be polite? Can your child self-govern their texting activity? Can your child handle unwanted attention in a clear and direct manner? Is your child comfortable enough with excusing themselves from a group chat that is negative? Does your child take online conflict offline, and keep it civil? Does your child come to you for advice when there is some kind of online trouble or conflict? Probably needless to say, distraction is a major issue. Young people tend to have multiple windows open, with multiple devices, music / video and chat apps open. There is such a massive amount of data available that the nature of school work has changed dramatically. (not to mention communication) It’s important that parents learn school technology practices and policies, as well as understand your child’s engagement with technology and homework. With children, parents and educators have to discuss things such as academic honesty, producing original work, how to collaborate, and when sharing work is and isn’t okay. MA: Bibliomotion, Inc, 2016. Print.